In a five hour operation, NSRI volunteers rescued 12 crew members who abandoned their 19.6 meter Hout Bay fishing trawler Claremont after it ran aground on the South Western side of Robben Island just after midnight this morning. One of the casualty crew managed to get to shore and NSRI rescue swimmers waded, swam and jumped from rock to rock in between crashing waves to reach the ship where four casualty crew members were found perched on a rock below their listing vessel. They were helped ashore. NSRI rescue swimmers swam them, waded them and helped them over rocks to reach the shore while wave sets continued to crash over the vessel and over the rescue effort. Pat van Eyssen, NSRI Table Bay station commander, said this morning, 13 August, NSRI Table Bay, NSRI Melkbosstrand and NSRI Bakoven volunteer sea rescue duty crews were activated by the Transnet National Ports Authority following a mayday distress call from the Claremont. “It appears that the vessel lost motor power and they were drifting ashore in storm seas with 5 to 6 meter breaking swells. The combined volunteer sea rescue duty crews launched their sea rescue crafts Spirit Of Vodacom, Rotary Endeavor, Spirit Of The Vines And Rotarian Schipper and responded. “NSRI Hout Bay and the WC Government Health EMS were placed on high alert. Telkom Maritime Radio Services provided VHF radio communications for the rescue operation. “NSRI rescue vehicles responded to Signal Hill to assist with communications and a WC Government Health EMS JOC (Joint Operations Command) vehicle was dispatched to assist on Signal Hill. The vessel had waves breaking over it and that they were already among the rocks and the vessel was being battered against rocks and was breaking up. “On arrival efforts to get the crew off from the sea side, with our NSRI rigid inflatable rescue craft darting in between wave sets under the illumination of white illuminating flares proved fruitless as waves of between 5 to 6 meter sets rolled in. This forced our rigid inflatable rescue craft to abandon the efforts each time to avoid being capsized or rammed into rocks. “By this stage it was clear that the crew aboard the casualty vessel were understandably panicking and showing a willingness to take their chances if they abandoned their ship but NSRI controllers, using as calm and reassuring voice tones, consoled them over the VHF radio’s to stay on the relative, although precarious, safety of their ship particularly since only 4 crew members were wearing life-jackets. “They were still at that stage a few 100 meters off-shore and their vessel gradually being swept between and over rocks and gradually breaking up as waves crashed over her as she was forced closer to the island. The Red Cross AMS Skymed 1 helicopter was placed on alert by Metro Control but they could only fly at first light. “MRCC (Maritime rescue Coordination Centre) activated the SA Air Force 22 Squadron Oryx helicopters with NSRI station 29 Helicopter rescue unit but they could only become airborne in 2 hours. The situation intensified when it became clear that the vessel was hard aground on rocks and listing to a 40 degree angle and casualty crew had no further choice and they began to abandon ship under their Captain’s instruction. “NSRI rescue crews raced into Murray Bay Harbour and summoned the Robben Island Security who mustered their staff. With an ambulance resident on the island), a mini bus and two bakkies the NSRI crews were driven by Robben Island security to the side of the island where the casualty crew were abandoning their ship. “The Transnet National Ports Authority activated a Pilot Boat to transport additional NSRI rescue crew, Metro rescue paramedics and rescue and medical equipment, including lighting, to the island from the V&A Waterfront. WC Government Health EMS ambulances and response paramedics were activated to respond to NSRI Table Bay rescue base to stand-by. “In relays all 11 casualty crew were helped ashore by the 8 NSRI rescue swimmers who had gone around to the land side. Only the skipper remained at his wheel house and he reported to require assistance as he was exhausted and he had succumbed to hypothermia. “NSRI rescue swimmers were able to retrieve him from the casualty vessel and he too was brought to shore. By 4.17 all crew members of Claremont were accounted for and ashore on Robben Island. They were transported by Robben Island vehicles to the island harbour and treatment for hypothermia and shock commenced. 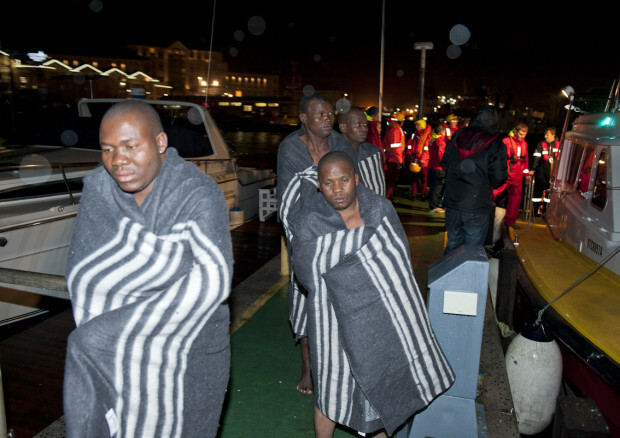 “They were taken aboard Spirit Of Vodacom and transported to our sea rescue base at the V&A Waterfront and all the dozen men were handed into the care of the Metro ambulance paramedics. They have been transported to Groote Schuur and New Somerset hospitals. All are in stable conditions, for treatment for hypothermia, and two also for treatment for back injuries. “All are males aged between 18 and 52. The rescue operation was completed at 5.17 am.